Not everyone is willing to take a risk when it comes to decor. What you put in your home is inevitably an extension of your personality. 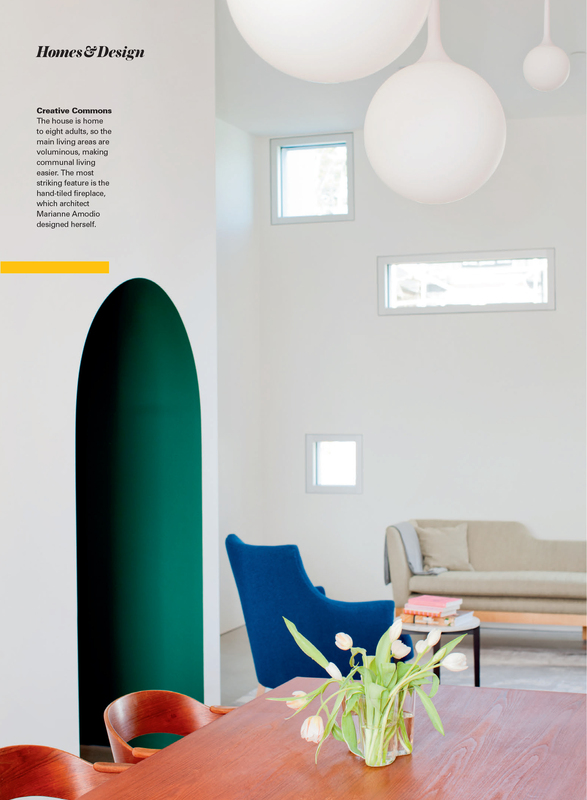 Maybe you’re a fan of clean lines and subdued tones. 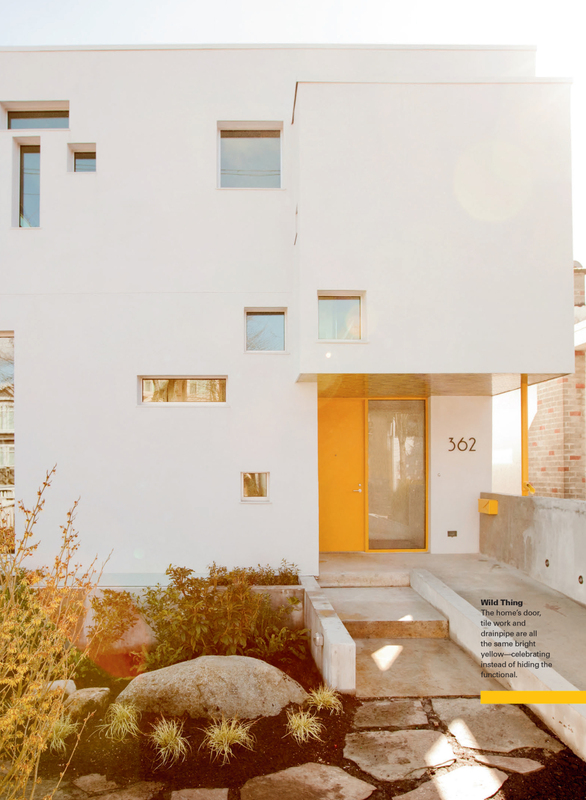 Or maybe you need your home to reflect your vibrant personality. But how do you incorporate these bold aesthetics without creating a space that’s garish and off-putting (and on budget)? 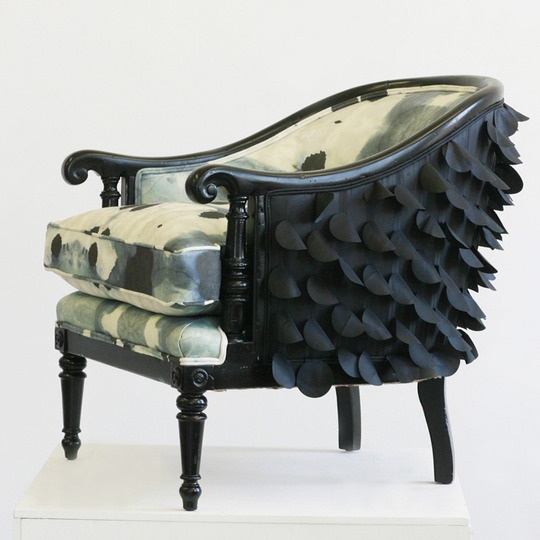 Now, we know what you’re probably thinking: ‘Reupholstery can be just as expensive as buying new furniture!’ It can be–but not if you do it yourself. If you’re willing to devote the energy to refreshing an old piece of furniture, do-it-yourself reupholstery can be a fun and rewarding process. We’ll show you a few projects that caught our eye and give you some tips for creating the perfect funky space. 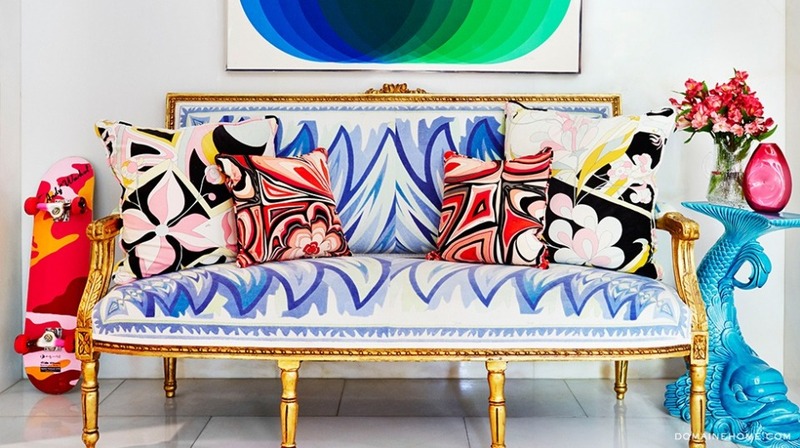 Take traditional or outdated upholstery by choosing fabrics that are eye-catching. 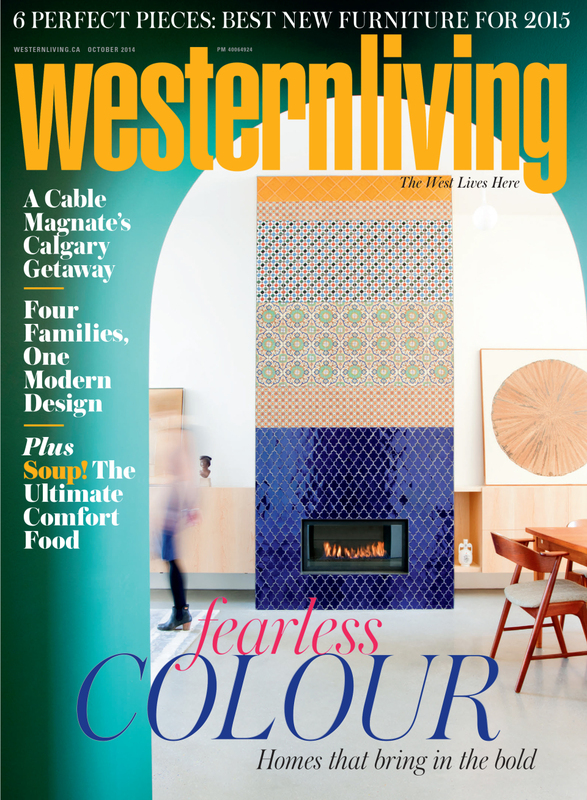 Experiment with colours and don’t be afraid of them clashing–if you approach the design of your space with a predetermined intent, it will show. A home office is the perfect setting for this striking chair. 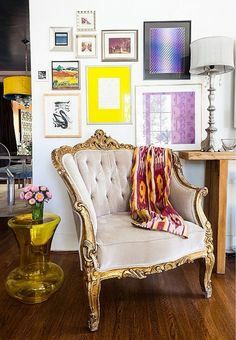 Use it as a focal point or combine it with some quirky artwork to bring a sense of vibrancy to the space. 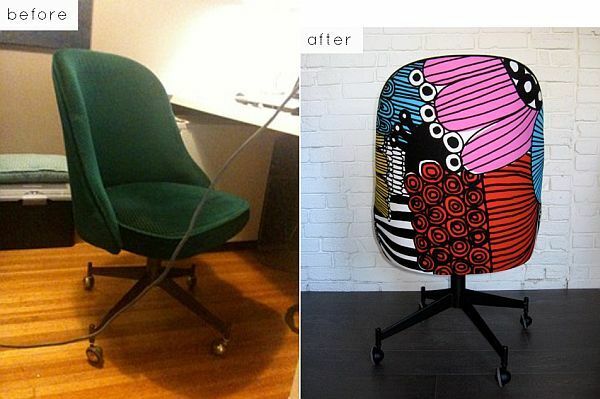 This transformation shows a very modern interpretation of the chair’s old upholstery. Use contrast as a way to enliven a space and add personality. Experiment with contrasting colours and styles or take inspiration from different design aesthetics. Pair a reupholstered French provincial loveseat with a sleek acrylic side table. By incorporating contrast, you create individuality and give your space a ‘curated’ feel. Colours and patterns add wild contrast. 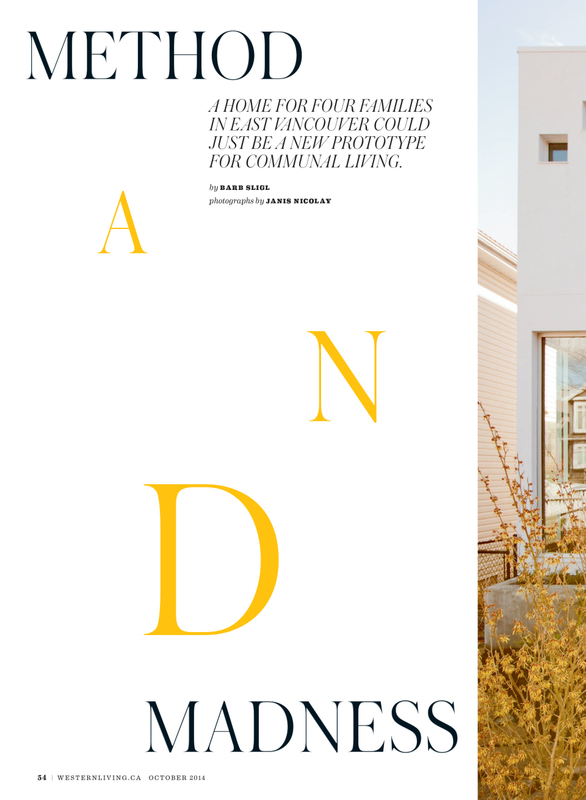 Experiment by contrasting traditional, old-word aesthetics with modern lines. This reupholstered and repainted armchair’s intricate detailing blends well with the knobby textures of the table lamp. When reupholstering a chair or loveseat, the feel of a fabric is just as important as its colour and design. Consider textured fabrics as a way of adding visual interest. For example, a chair reupholstered in black leather works well with a furry, chunky throw. This chair’s backing creates visual interest and compliments the interior upholstery. 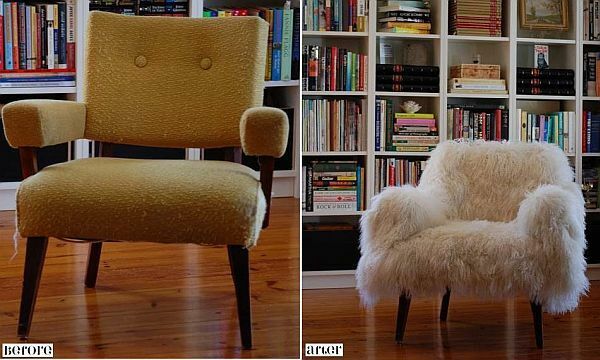 An even cheaper alternative to reupholstering your piece is to swaddle it in a furry or textured cover. This has the dual effect of creating textural interest and refreshing your furniture. As with all refurbishments, make sure that the thing you’re refurbishing is still in useable condition. Dents and scratches in a chair frame aren’t a big deal–those can be fixed–but be wary of structural damage that can compromise the integrity of a piece. Reupholstering an old piece is an investment, and generally, the golden rule is that older furniture is better. You can be sure that chairs and couches that were crafted 40 or 50 years are solid wood–some may even be handcrafted. These pieces have stood the test of time, so if they haven’t thrown in the towel yet, it’s safe to assume they’ll last you for more years to come. 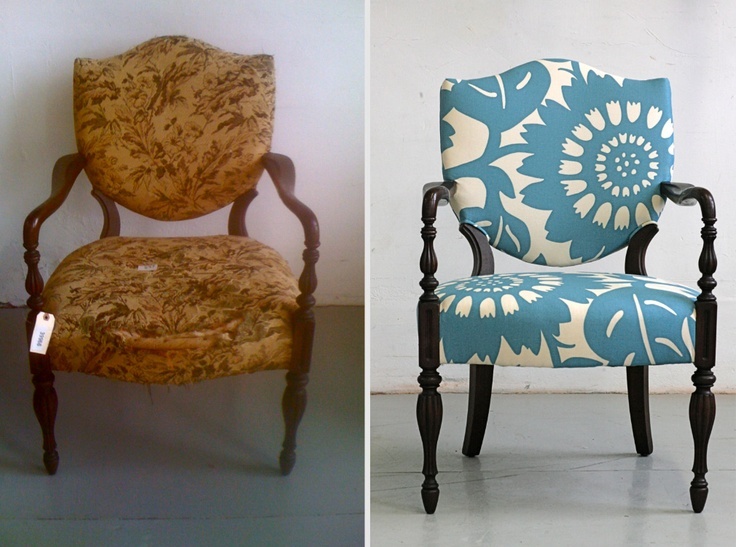 For more reupholstery inspiration and links to tutorials, check out our Pinterest board! Follow Novell Design Build’s board Reupholstery on Pinterest. 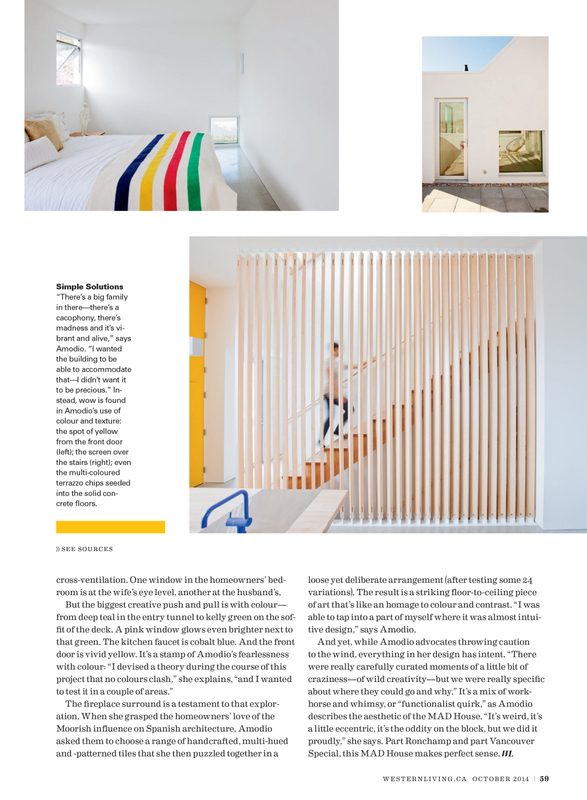 Also, for fans of funky furniture and decor, read up on this home that combines old-world feel with modern aesthetics. What says ‘Halloween’ more than haunted houses? Probably nothing. We’ve searched high and low for the creepiest, crawliest and quirkiest haunted houses (and buildings). Some are really old, some are architectural oddities and some are just downright weird. 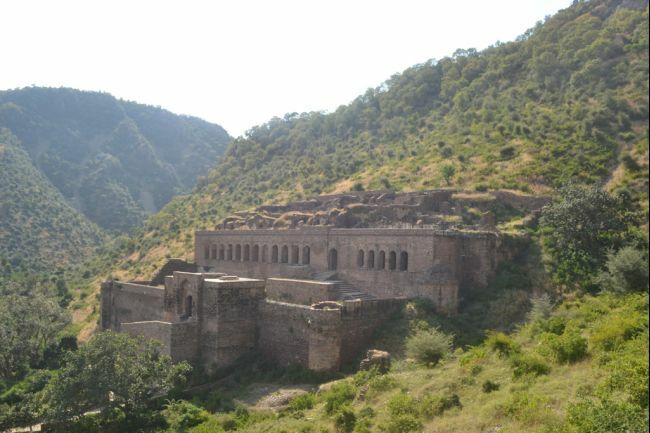 Located in northwestern India in the state of Rajasthan, this fort was built in the early 17th century and is characteristic of Indian architecture of that era. While it is not clear what caused its abandonment, one legend explains that the fort city was cursed by a wizard. After failing to use a love potion on the princess of Bhangarh, the wizard was crushed by a rolling boulder. Some time after, the town was invaded and all its inhabitants perished. It is believed that the spirits of those killed, including the princess and the wizard, continue to haunt the area. The Architectural Survey of India, which manages the ruins, forbids visitors from remaining there after dark. This is an odd one. The house was built by George Stickney, a spiritualist, in 1836. He and his wife would conduct seances in an attempt to commune with the spirits of their dead children. In order to allow directionally challenged spirits to roam freely, he designed the house so that no walls met at 90-degree angles. This is what gives the house its curved look. 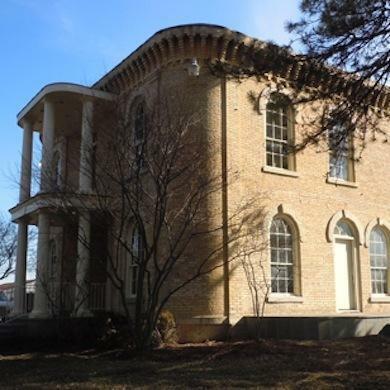 Built in the Italianate style, this building now houses the local police department. Flickering lights, doors opening and closing and moving objects have all been reported. It’s not really a castle, but after multiple alterations and additions, and gargoyles, it sure looks like one. This Queen Anne house was built for German immigrant, Hannes Tiedemann and his family in 1881. Within a few short years, Tiedemann’s daughter, mother and three children all died, some under suspect circumstances. Tiedemann chose to distract his distraught wife by building a ballroom in the home as well as adding gargoyles to its exterior. His wife died in 1895, and Tiedemann himself died in 1908 with no family left to inherit his estate. 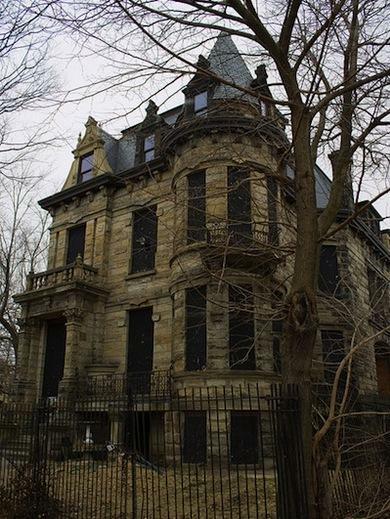 Since then, the house has earned its reputation as one of the most haunted houses in Ohio with reports of spinning chandeliers, crying children and disembodied faces. 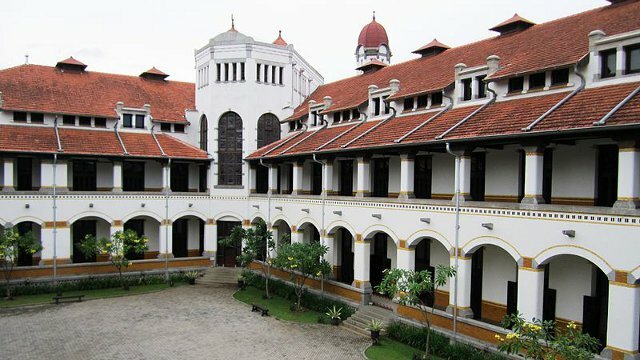 This building complex was finished in the early 1900s by the Dutch East Indian Railway Company and to this day remains a well-preserved example of Indonesian colonial architecture. When the Japanese invaded Indonesia in WWII, the basement was converted into a prison where several executions were carried out. The complex has been the site of other conflicts, including one between Dutch and Indonesian fighters. Headless spirits and the ghost of a Dutch woman who committed suicide are all said to wander the complex. 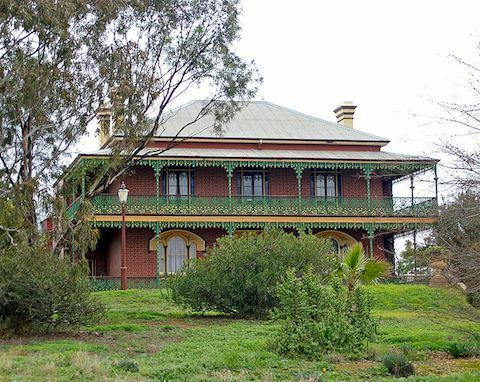 It’s regarded as the most haunted house in Australia. This Victorian manor was built by Christopher William Crawley in 1885. Crawley was a wealthy landowner who was seen in the local area as a generous and philanthropic figure. After its construction, the manor hosted all sorts of gruesome events. Among those were the confinement of a mentally ill man, a stable boy who burned to death, and the murder of a caretaker. When Crawley himself died, his distraught wife didn’t leave the home for 23 years. The manor is now thought to be haunted by the ghosts of Crawley and his wife. Ready to start on your home (haunted or not)? Then contact us today at hello@novelldesignbuild.com. 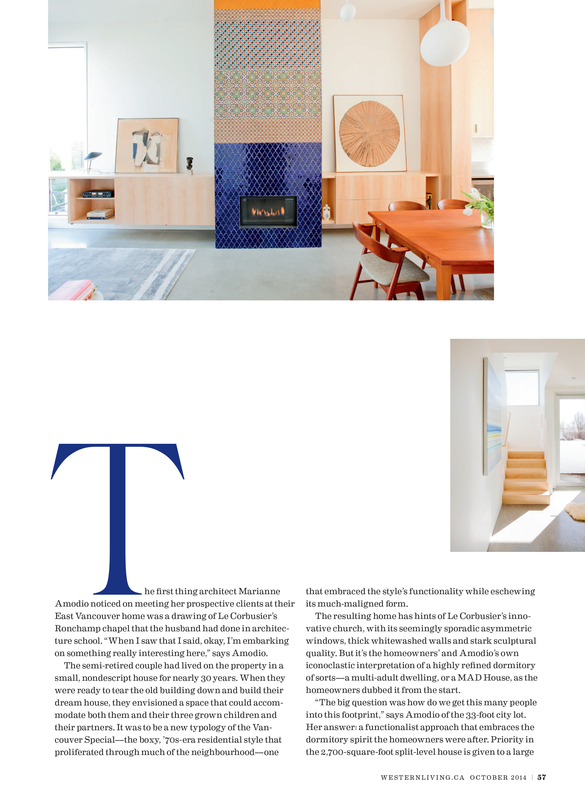 Our bold, whimsical collaboration with Marianne Amodio Architecture Studio is featured in the magazine’s October issue. Take a read through the article to discover more about the design intent and concepts behind this MAD house.For more information on this project, check out our portfolio. Click on an image to enlarge. The leaves have started changing colour and the days are crisp and chilly; fall is definitely here. With Thanksgiving right around the corner, it’s time to get those Pinterest boards fired up, charger plates dusted off and decor picked. Turkey Day is about family tradition and we love that–it’s just that traditional sometimes equals conventional. So let’s push those boundaries in style! When we think of fall colours we often picture oranges and yellows, dark earth tones, and metallics like copper and brass. And by association, these colours get lumped in with Thanksgiving as well. A discerning colour palette helps to reduce visual clutter. 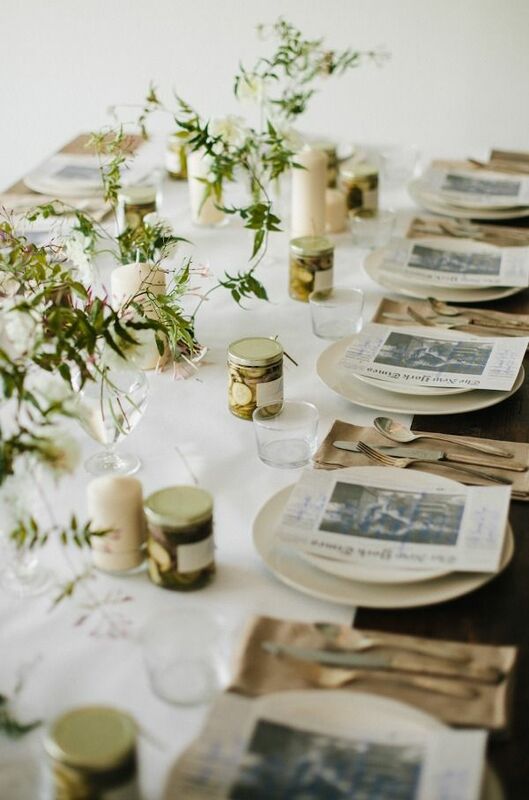 This simple arrangement uses tones like greens, tans, and off-whites to create a natural-feeling tablescape. 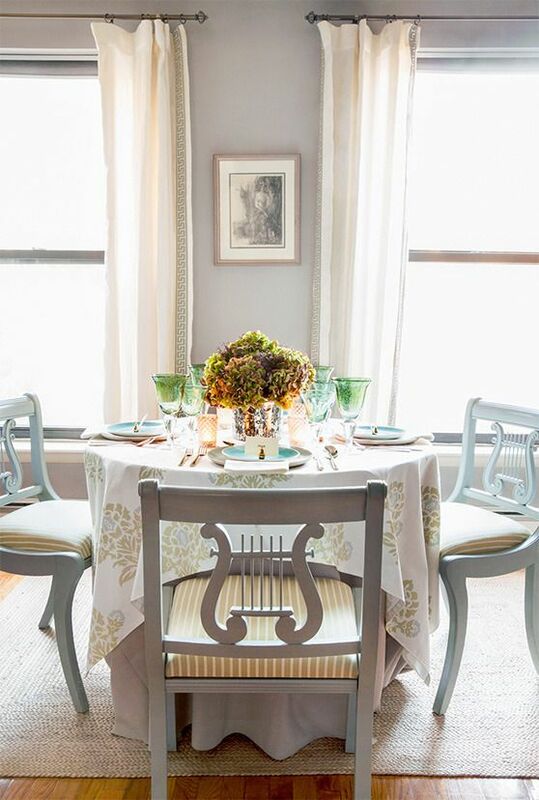 Commonly associated with weddings, this is one Thanksgiving table sure to break away from tradition. Tablescapes are a big deal for Thanksgiving; the table is the focal point for both entertaining and dining. So instead of the conventional fall colours, pick brighter hues, experiment with pastels, even incorporate an electric blue here and there. A colourful centrepiece anchors an otherwise monochromatic table arrangement. A round table, which helps facilitate conversation and interaction, breaks the norm of have a long rectangular dining table. Natural elements are a big feature in Thanksgiving decor. The can be used to add a variety of textures and hues. For the truly DIY, they are also a relatively low-cost option to decorating your table for the holidays. A plank of rough wood makes for a clever runner that adds a natural element to the Thanksgiving table. 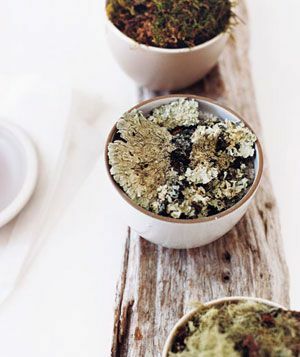 Mosses and lichens add earth tones and texture. 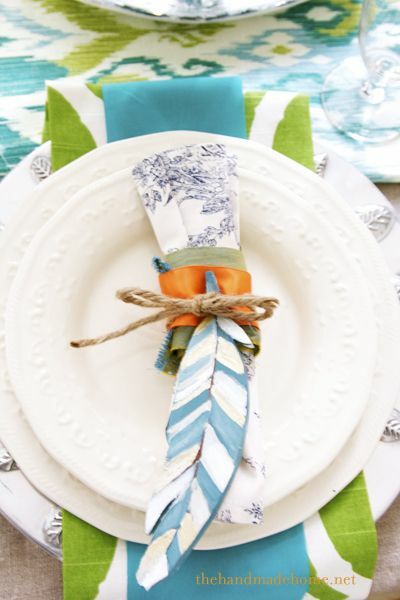 A brightly coloured feather is a natural adornment to a napkin ring. A pop of classic fall orange contrasts nicely with cool hues. We often like tradition to provide guidelines for our decor, but for the truly bold a reinterpretation of the rules isn’t always enough. Convention is more of an afterthought in this tablescape. 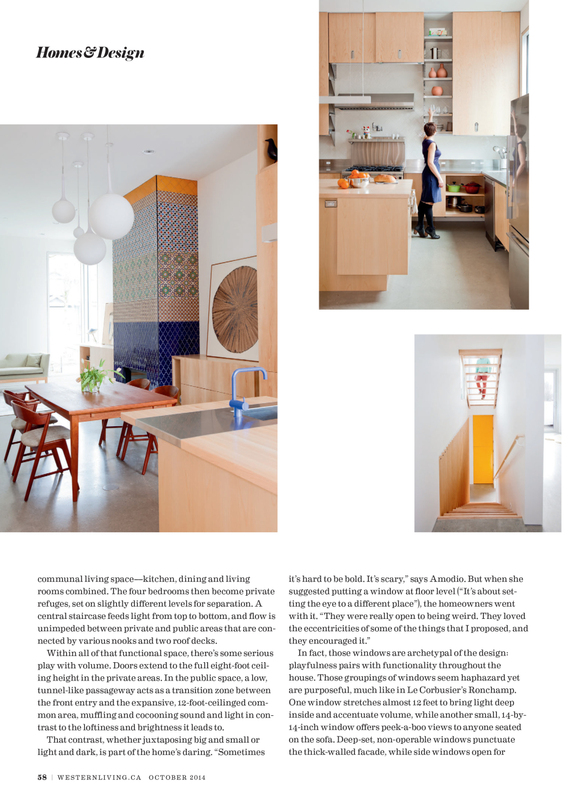 Bold colours, patterns and accents make an impact. And finally, the pumpkin: the staple of all things autumn. 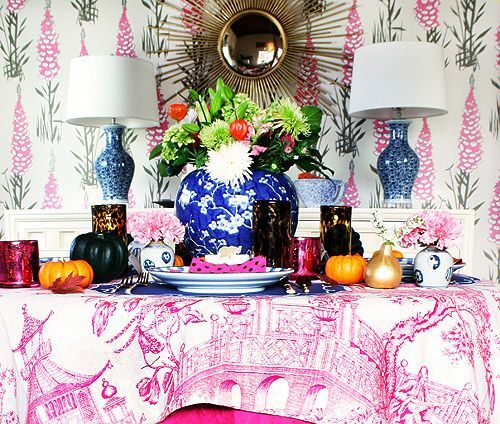 When it comes to Thanksgiving decor, you can’t go wrong with everyone’s favourite shapely gourd. But let’s see if we can’t put our own spin on a fall classic. 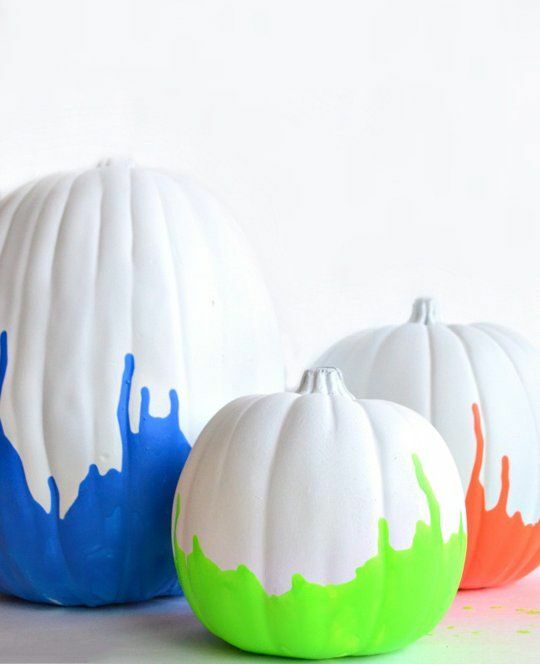 Intense colours make an impact on white painted pumpkins. 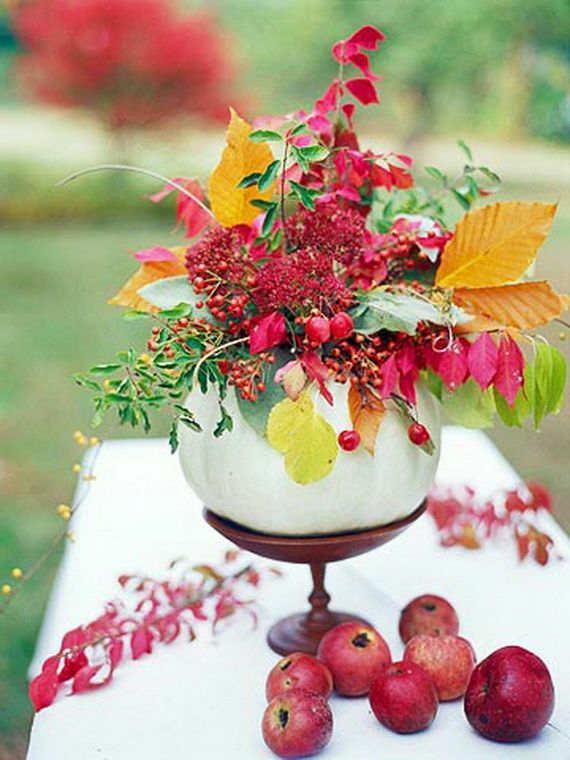 A white painted pumpkin holds a colourful arrangement of berries and leaves. A more traditional arrangement opts for a monochrome palette that contrasts fall colours with white pumpkins. Even a Thanksgiving tradition like apple pie isn’t safe from a refresher. 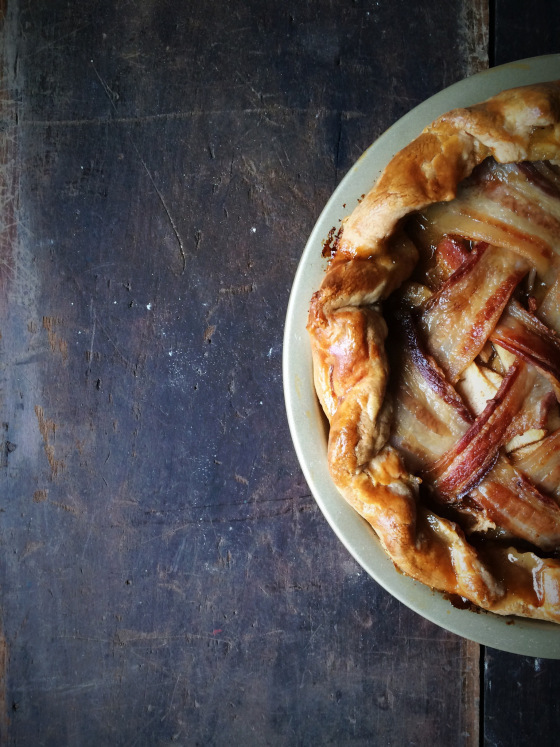 Bacon adds a savoury, smoky kick to this sweet treat. Hungry for more unconventional Thanksgiving inspiration? Check out our Pinterest board for decor ideas and more! 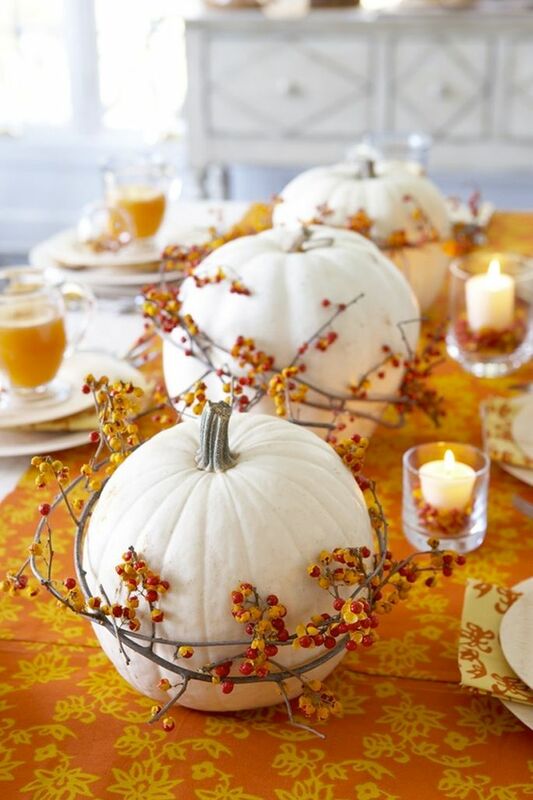 Follow Novell Design Build’s board Unconventional Thanksgiving on Pinterest.